Golden Boot winner Jack Marriott. 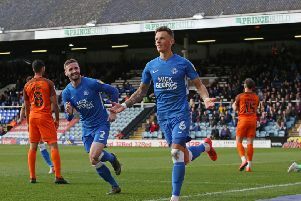 Peterborough United chairman Darragh MacAnthony has told fans to calm down over the future of star striker Jack Marriott. Both Derby County and Bristol City are understood to have tabled bids for the 23-year-old hot-shot, who scored 33 goals last season and won the League One Golden Boot award. Speculation has been growing over Marriott this month, with Posh director of football Barry Fry stating that eight clubs were interested in the player. Bristol City have been confirmed as one of those clubs. Derby chairman Mel Morris meanwhile has said the club “will not be making significant investment” this summer as they try to balance the books in order to comply with Financial Fair Play regulations. However, they could raise funds by selling players - notably star man Matej Vydra, who is wanted by Leeds United and are reportedly weighing up a bid of around £12m from the Yorkshire club . Posh state they will hold out until their £6 million valuation of the player is met. Nottingham Forest, Leeds United and Norwich City are also said to be interested in the striker.